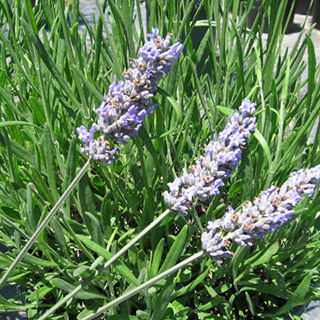 Lavender takes it name from the Latin lavare (to wash), and has been used to scent bath oils and soaps for centuries. It originates in Mediterranean regions and is still closely associated with the perfume industry in southern France. Lavender is a mild sedative for treating headaches, nervousness, and nervous insomnia. Simply smelling the living flowers or a bundle of dried flowering stalks in an uplifting experience, especially good for convalescents. Lavender is also a digestive remedy, especially useful for treating any sensation of overfullness or nausea after eating. The essential oil of lavender is valued for its helpful effects for muscle aches and respiratory problems. Make an infusion of 1 cup of boiling water over 1–2 tsp flowers and drink 1 cup up to 3 times daily for nervous exhaustion or tension headaches. 1 cup before bedtime can also help with insomnia. Take up to 1 tsp (5ml) twice a day for headaches, depression, or nervous tension. Can also help ease asthma, especially where attacks are triggered by nervousness or stress. Dilute 40 drops (2ml) of essential oil in 2 tsp (10ml) carrier oil. Use for muscular pains, or rub into the temples and the nape of the neck for tension headaches or at the first sign of a migraine. Dilute 20 drops (1ml) of essential oil in a jug of water as a final hair rinse for head lice, and use a few drops of neat oil on a fine-toothed comb run through the hair to remove both lice and nits. Use neat on insect bites or stings, or add 10 drops to 13/4fl oz (50ml) of water to use as a lotion for sunburn. Add 3–4 drops to a tissue and place on the pillow to aid sleep. Prefers well-drained, moderately fertile soil in full sun. Germination from seed can be erratic; alternatively, take semi-ripe cuttings in summer. Flowers are usually harvested in the mornings on sunny days in summer.